Heat Pump Vs Heating Boiler: Which One Should You Choose? A few decades ago, our choices for home heating and cooling were pretty simple. If we wanted air conditioning, we purchased an air conditioner. If we wanted heating, we purchased a furnace or a gas stove, or we built ourselves a fireplace. Today, the HVAC menu of options looks vastly different! You have so many options, it is like going through a heating and air conditioning buffet! Of course, while it is always so lovely to have more options, this can also make the decision-making process that much more complicated and time-consuming. One question that is cropping up more and more among our customers is what the difference is between a heat pump and a heating boiler (after all, their names sound quite similar) and which one is a better choice. Let’s find out! As you may already be somewhat aware, the heating boiler is not a new invention. However, heating boilers are not as popular in North America as is the traditional furnace. A heating boiler, as its name hints, heats water to do its job of heating your home. The heat output comes in the form of either hot water or steam. You can choose from a variety of energy types: natural gas, propane, oil, electric or pellets (biomass). A heating boiler uses a different type of distribution system from your typical furnace. It can convey the heated water or steam through a baseboard radiator or a radiant floor network, or it can use a coil. Heating boilers do not provide air cooling. However, a system boiler can pull double-duty to provide hot water. The heat pump is not precisely a new invention: It was actually first developed in 1852 by a British engineer. But the technology itself was first widely used not for heating and cooling your home, but for your refrigerator to keep your food fresh! Heat pumps can distribute heat via air ducts, radiators or radiant flooring. 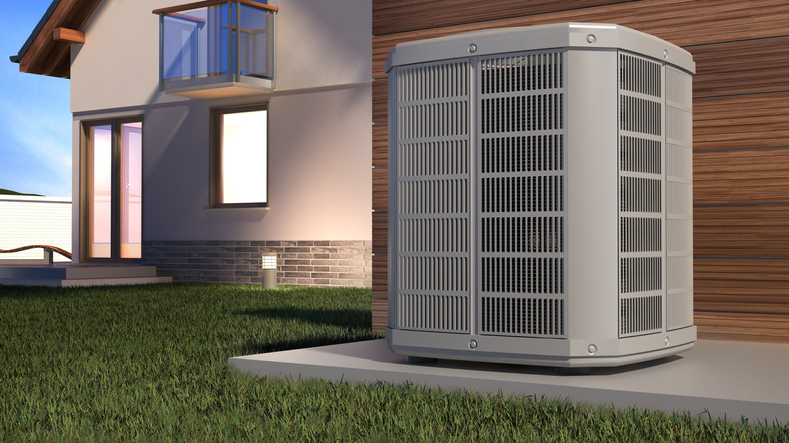 The ductless mini-split heat pump uses a zoning system. The heat pump, like the conventional refrigerator, uses electricity and refrigerant to do its work. Today, there are three different types of heat pump systems: air-to-air, water source and geothermal (ground source). The last was the first to be invented, and it happened right here in North America in the 1940s. As with any new invention, it took several years (decades, really) to work out the kinks. But today, the heat pump is already a staple in countries like China and throughout Europe and is fast becoming a favourite here in Canada as well. Heat pumps can do it all: They can heat and cool your home, and some can also provide hot water. Heating Boiler Versus Heat Pump: Which One Is Right for You? So now let’s take a look at some important differences between a heating boiler and a heat pump to help you narrow down your search. Heating boilers work with radiators, coils or radiant flooring. Heat pumps can work with air ducts, radiators or radiant flooring. However, a heat pump can only cool your home efficiently when you opt for air duct distribution. Heating boilers can work with any type of existing conventional energy source (oil, natural gas, propane, electricity, biomass pellets). Heat pumps use electric energy and refrigerant for power. To do their job, they move heat energy stored in air, water or earth. A heating boiler requires only indoor space to do its job. There are two types of heating boiler mounting options: floor or wall-mount. But each will reduce the amount of available space in a room by the size of the unit (suitcase-sized), plus a safety perimeter. If you want your heating boiler to provide hot water as well, you have two options: a traditional hot water tank or a smaller combi-boiler that connects to the water mains to bypass the need for a tank. A heat pump requires both indoor and outdoor space. The indoor unit is typically quite compact and can be mounted higher on a wall to save space. The outdoor space required varies by type of heat pump. The air-to-air heat pump needs only a similar amount of space as a traditional outdoor air conditioner component. The water-source requires access to a nearby pond with pipes running between the water and your residence. The geothermal heat pump has a system of pipes that can be run horizontally or vertically depending on space availability. Well-maintained modern heating boilers can easily provide up to 98.5 percent AFUE (energy efficiency). But the heat pump blows away even this near-perfect rating. Because heat pumps recycle heat energy from the air, water or ground, a modern heat pump can achieve up to 400 percent efficiency. Typically, a heating boiler system is relatively easy to install. The one exception is if you need to install a distribution system or retrofit/repair your existing distribution system. An air-to-air heat pump that is ducted or ductless is also relatively easy to install. A water source or geothermal heat pump, on the other hand, can be invasive to the surrounding land or water because a piping system must be laid down. Heating boilers need to have at least a once-annual inspection and servicing to maintain energy efficiency. Heat pumps can go for longer without inspections and maintenance, although annual is still recommended to prevent any minor issues from becoming larger, more expensive ones. Heating boilers are nearly always less expensive up front than heat pump systems regardless of type. Government-funded rebates and credits are often available for upgrading to either a heating boiler or a heat pump system. Ready to learn more about heating boilers and heat pumps?